Samuel lived his whole life in Watertown. 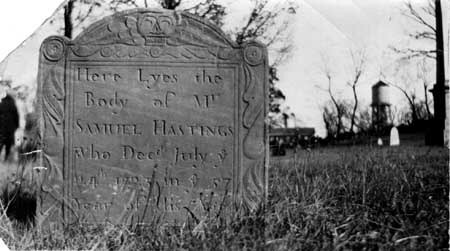 On March 12, 1665, he became the the last child born to Thomas and Margaret (Cheney) Hastings. His father died when he was 20 years old which resulted in one of the curiosities of his life — John Nevinson (his eventual father-in-law and originally from Surrey, England) was appointed as his guardian although he had achieved “majority.” In 1695 he took over a public house or “pub” in the place where had one had been operated by Nevinson. Perhaps because of the large shadow cast by his father, he was relatively inactive in town government and held only modest offices. He married first, Lydia Church of Dedham, on Jan. 1, 1687. She died nearly four years to the day later. He married second, Elizabeth Nevinson, on April 24, 1694. She died in 1700. On July 1, 1701, he was married for the third and final time Sarah Coolidge. Because of Puritan views that church weddings were not biblically based, these all would have been civil ceremonies outside the church. Samuel kept a tavern in Watertown but, other than that, left little impression in the records of Watertown. He died at the age of 58 on July 24, 1723. While this seems young to us today, the average age of death for his siblings was 54. Sarah died less than a year later on Jan. 26, 1724. They are buried at the Old Burying Ground on Arlington St. in Watertown, although not together. His tombstone above can be found not far from the gate at Plot 217. About the Thomas Hastings Descendants Database Project: This database of Thomas Hastings descendants and related families was begun over nearly 20 years ago. It now contains over 42,000 individuals — many with narrative, photographs and other life artifacts such as signatures, Wills, etc.. The goal of this project is to produce a modern update to the venerable Hastings Memorial originally published in 1866 that will carry as many lines as possible to the present day. Shown below are some surnames of those descendants who have contributed information to this line. If you would like to contribute, please email Scott Billigmeier (SBmeier@outlook.com). About the Thomas Hastings Y – DNA Project: We are looking for descendants of Thomas Hastings whose ancestry is partrilineal (unbroken male line from father to son) for the purpose of determining his English ancestry. Thus far, the paper trail has run cold beyond his departure from Ipswich, Suffolk, England in April 1634. Identifying the Haplogroup and subclade of his male descendants, with the unique DNA sequences that mark every Y choromsome, will be key to solving mysteries such as when the Hastings arrived in the British Isles, perhaps where and whether, once and for all, they are connected to the noble Hastings families. We are in particular need of qualified volunteers descended from this son. For more information on how to participate please visit our Y-DNA project page.